Though the embarrassing interpretation of the 2000 AD character from 1995 is gone but not forgotten, the famed law enforcer Judge Dredd dons his uniform in the live action environment once again with this year's Dredd, a new deliciously gritty and violent adaptation that serves to reintegrate the character into contemporary cinema whilst also abolishing all memory of Stallone's craptastic fare - a mission that is most definitely successful. Dredd takes place in the futuristic Mega City One, a decadent urban wasteland cemented in the middle of a lifeless desert. The city is fueled by crime and injustice, with only one thing enforcing law and order: The Hall of Justice and it's officers, the Judges. 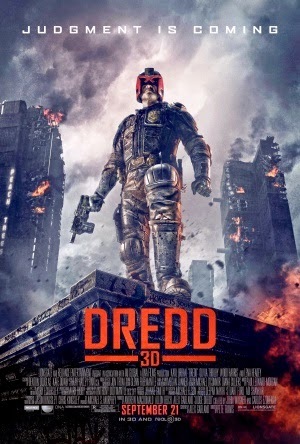 Housing the power of Judge, Jury and Executioner, the feared yet renowned Judge Dredd (Karl Urban) is tasked with assessing new recruit Judge Anderson (Olivia Thirlby), a psychic whose powers compensate for her apparent lack of ability. Both Judges soon find themselves trapped in a 200 story slum when investigating the spread of Slo-Mo, a recreational drug evolving into an epidemic, and must locate the drug's creator Ma-Ma (Lena Headey) whilst fighting off her clan for the sake of their lives. Dredd was built off a budget of $45 million, seemingly meagre compared to the enormous $100-200 million budgets of Hollywood science fiction blockbusters. The budget is something that is surprisingly unnoticeable; the science fiction setting is captured nicely through some fantastic mise en scene, from the detailed and futuristic Mega City One to the contemporary yet high tech firearms. The sci-fi element feels perfectly natural and realistic across this decadent society, and though it's always there throughout the film, the action is generally built off bloody firefights and intense hand to hand battles. The Slo-Mo drug makes for some highly exaggerated gory moments, all of which aren't overly disturbing due to their stylization, and often exploits the 3D effect for some interesting moments. Though this can partially justify the depth to the visuals, the 3D is often unnoticeable and so conservative that you'll often forget it's even there. The film is universally well acted, with Karl Urban easily improving upon the hilarity and stupidity of Stallone's performance seventeen years ago (not that he had much to surpass). His ability to handle Dredd's lack of emotion yet craft him into an interesting character is highly impressive; Dredd is never rendered to be an unbeatable superhero, but a man just doing his job who feels little to no compassion for those who cause injustice and crime in his city. He has his moments of humour, but Dredd is a professional and ruthless badass - his mentor like relationship with Judge Anderson is entertaining and thankfully never shoehorned into a contrived romance. Thirlby injects a bit more emotion and compassion into the film's plot and still entertains, and the remorseful Ma-Ma is flawlessly portrayed by Lena Headey; she's scary, psychotic and intimidating, working perfectly as the antagonist. Dredd has moments of bloody violence and some hefty graphic content, so it's not one for the kiddies. Though adapted from a comic book, it proves to be nailed in it's own gritty vibe in a way that really works; the violence is very stylized and entertaining, and the shock value that comes with some of it enjoyably knows no bounds. The narrative feels a tad flimsy at times and the film can sometimes chug onward at a sluggish pace, but it's all in all a well rounded cinematic portrayal of an entertaining character and those who felt betrayed at Stallone's laughable rendition can now put their troubled minds to rest.